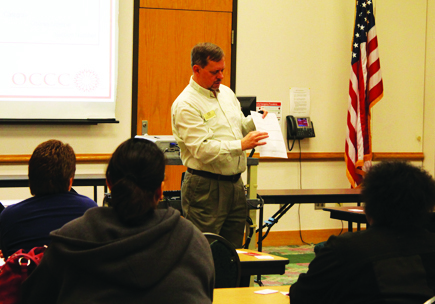 OCCC Academic Adviser Tennent Emmons shows students how to get enrolled for summer and fall classes during a Brown Bag luncheon March 9. Brown Bags, hosted by Student Life, are held weekly on campus. “This is enrollment 101, and it is to discuss how a person sets about enrolling in their (general) education classes for their beginning courses that they need for their degree.” Emmons said. He said students need to start scheduling summer and fall classes now. Although fall and summer schedules are not available as hard copies yet, Emmons said they are available online. “They are on MineOnline so students can look at that to make up their schedule for this summer and fall schedule,” he said. The speech also covered the requirements for classes and when a student can enroll for a class. OCCC student Jarmila Jayden attended. “It’s very educational to attend (Brown Bags,) because it gives you an inside view on the best times to enroll, how to go about enrolling, and how to look at the catalogue as to what classes you need pick,” Jayden said. For more information about enrollment, visit MineOnline, accessible through the college’s website at http://mineonline.occc.edu.